Posh star Marcus Maddison leads the long walk to the centre circle after Rochdale's second goal. Photo: Joe Dent/theposh.com. Peterborough United played poorly and deservedly slipper to a 2-0 defeat at lowly Rochdale today (November 25). Dale are the third team this season to start the day in the bottom four of the League One table and yet beat Posh comfortably. Oldham and Gillingham also managed it. Leo Da Silva of Posh is tackled by Rochdale's Ollie Rathbone. Photo: Joe Dent/theposh.com. Two goals in four minutes from Calvin Andrew and Callum Camps settled a poor quality clash. Posh created very little until Ricky Miller, one of three half-time substitutes, forced a save from Dale ‘keeper Josh Lillis 20 minutes from time. Posh rarely strung three passes together. Even Marcus Maddison’s set pieces were woeful. Posh were seeking back-to-back wins for the first time since the end of August, a task made harder by the absence of Gwion Edwards because of suspension and Dale’s decision to keep former Posh full-back Kgosi Ntlhe on the substitutes’ bench until late on. The home side decided to match up the most popular Posh formation of 3-4-1-2 without realising Grant McCann had recalled Jermaine Anderson to his starting line-up for the first time since October 21 and switched to a midfield diamond formation. Posh striker Jack Marriott in action at Rochdale. Photo: Joe Dent/theposh.com. 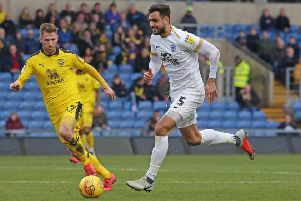 No matter, whereas Posh laboured without any forward penetration, the home side dominated possession, kept finding wing-back Joe Rafferty free on the right and waited for the chances to come. Dale lacked mobility up front once in-form striker Matty Done had departed with a seventh-minute injury, but they took control with a two-goal burst inside four first half minutes. Rafferty’s low cross was controlled by Andrew and his turn and shot gave Dale a 34th minute lead. It was Andrew’s first goal of the season. And right back for the day Leo Da Silva’s foul on the edge of the area enabled Camps to blast a free kick through Conor O’Malley’s hands for 2-0 in the 38th minute. Posh frittered possession away easily with only Maddison’s jousts with his designated shadow for the day, Oliver Rathbone, causing any entertainment. Maddison appeared to be tripped inside the area midway through the first-half, but referee Martin Coy and a well-placed assistant referee ignored what looked like a very reasonable claim. Otherwise Posh were restricted to a Maddison shot straight at Lillis and a couple of half-hearted long range efforts. At the other end Andrew headed wide at the near post and Rafferty and Ian Henderson saw shots well blocked by Jack Baldwin and Andrew Hughes. A woeful 45 minutes prompted McCann to morph into Barry Fry at the break as a triple substitution was executed with Chris Forrester, Idris Kanu and Ricky Miller on for Danny Lloyd, Michael Doughty and Anderson. For a few minutes Posh improved with Da Silva Lopes slinging a couple of decent crosses into the area, but that threat soon vanished. Da Silva Lopes was ordered further forward for the final quarter and one surging run was followed by a neat pass that emabled Miller to shoot first time, but straight at Lillis. Posh exerted some pressure towards the end, but it ultimately was a very comfortable win for the home side. It was fine way for popular Dale manager Keith Hill to celebrate his 500th match in charge of the club. Attendance: 2,555 (no Posh figure).